Thank you for the early morning laugh! Loved those campaign ads. Now to get going and roast a turkey for a bunch of people. My family is split on the whole Hillary/Donald issue, so let’s hope we don’t talk politics today! She must still be waiting for her trophy, for second place. 1. He was such a good President, that she couldn't improve upon his accomplishments? 2. He was such a bad President, that nobody wanted an Obama clone? The quotation implies the first, surely. "Agenda for change" demands bad things that need to be changed, which can be criticised. Her complaint is that Obama wasn't leaving her enough bad things to get her teeth into. Or perhaps, more simply, that it is bad form to criticise a President of your own party, which inhibited her from using that political tool. Harold Wilson won a second election on the slogan "You KNOW Labour government works". I can't remember whether "Don't let [the other side] spoil it!" was his or Maggie's. Is it so difficult in America to campaign on the basis of "Let's keep the good things we've got", or is it just a specifically left-wing problem? Funny how people mock Hillary because of her age yet hope that an obese 70 year old senior citizen with a fake health record will be president for 8 years. Hillary being Hillary kept her from winning. Most of the people who I know voted Trump did it cause it was ANYONE but Hillary. Nobody was in support of giving her the keys to the kingdom after all the BS, lying about being shot at, the looting spree known as the Clinton Foundation or about a thousand other things. She lost based on her proven track record in politics. The meme's were hysterical tho...!!! 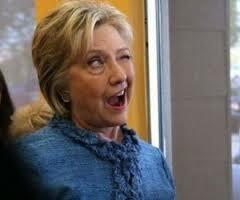 After deep reflection, Hillary wishes that Obama was not the President she was attempting to succeed. Hillary Clinton said in a new interview that her inability to run on an "agenda of change," coming off of President Barack Obama's two terms, was a significant problem for her 2016 campaign. "It is true that when you run to succeed a two-term president of your own party, you have a historical headwind blowing against you," Clinton told radio host Hugh Hewitt. "It’s not just this campaign can be set apart from everything that’s ever happened in our politics. It is a challenge." This could be Hillary saying that she feels more confident about her success, running against President Trump in 2020. At least you got one thing right about Trump. He will be President for 8 years.